Experience one of the most highly sought after floorsplans in Scotts Valleys centrally located Hidden Oaks complex. This End-Unit, reverse floorplan home offers 2 cozy bedrooms, a full bath & laundry on the ground floor. 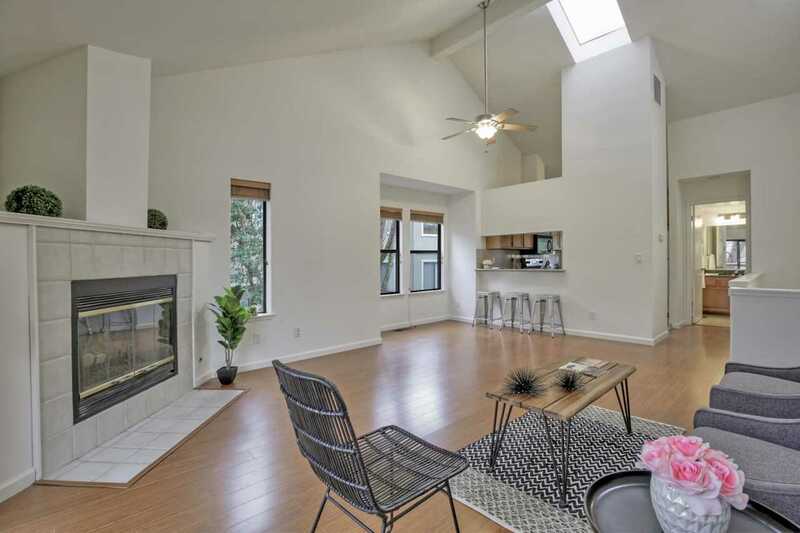 Upstairs you will find expansive vaulted ceilings with skylights in your kitchen & dining/living room, & a full bath. Enjoy a cozy fire while you watch the sun setting from your private deck. The sellers have upgraded the kitchen & bathroom counters with granite, laminate flooring upstairs, freshly painted the interior, new carpet in the bedrooms & added modern electrical toggle switches.Â Just steps from your front door is your detached 1-car garage with room for extra storage. Hidden Oaks has 2 pools, 4 hot tubs, is within walking distance to the transit station, Skypark, SV Middle School, library, groceries, & much more. Â SV is a top rated school district, in a tight knit community with very low crime. Come find why Scotts Valley is a wonderful place to call home. SchoolsClick map icons below to view information for schools near 111 Bean Creek Rd 158 Scotts Valley, CA 95066. Listing provided courtesy of Keller Williams-Santa Cruz. Scotts Valley Real Estate at 111 Bean Creek Rd 158 Scotts Valley, CA 95066. Description: The real estate listing at 111 Bean Creek Rd 158 Scotts Valley, CA 95066 with the MLS# ML81737747 has been on the Scotts Valley market for 77 days and is currently listed for $535,000. You are currently viewing the property details of the MLSListings MLS listing at 111 Bean Creek Rd 158 Scotts Valley, CA 95066, which features 2 bedrooms, 2 bathrooms and has approximately 1108 sq.ft. of living area.